One of the visually most surprising buildings in the world is Saint Basil’s Cathedral in Moscow, Russia. This amazing church was built 450 years ago next to the Moscow Kremlin. 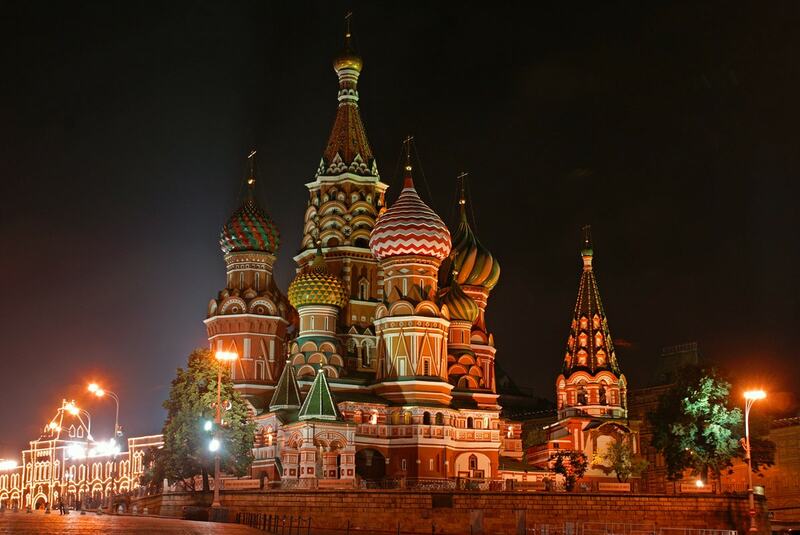 The history of Saint Basil’s Cathedral was started by Ivan the Terrible – the tsar of Russia who reigned in 1533 – 1584. In his time the area governed from Moscow expanded mainly in southern and eastern directions, reaching Caspian Sea and stepping over Urals into Western Siberia. Troops of Ivan the Terrible won many significant victories and one of the most important was the capture of Kazan in 1552. 1552 – 1555: "Churches of triumph"
It has been very important for rulers to mark their achievements and victories in all times and all countries. Ivan the Terrible was not an exception to this. In the 1550s there was built the first church – Trinity Church, built of white stone and commemorating the capture of Kazan. At the end of Astrakhan campaign (1556) there were built seven more wooden churches around the Trinity church, next to it. Such churches commemorating military victories were seen as something new, also their planning and outer look was highly original. Churches were located outside the walls of Kremlin – what also was something new, seen as a bow towards the populace of Moscow. The church is named after Basil the Blessed (in Russian – Василий Блаженный, lived in 1469 – 1552) – an eccentric Russian Orthodox saint. He devoted himself to a specific kind of servitude to God – yurodstvo – where the devotee pretends to be a fool and refuses any comforts. Thus Basil the Blessed lived without a permanent residence, walked naked, with chains and deliberately summoned to humiliations from the cruel crowd (although in general, he was much respected). Basil the Blessed gained respect through his candid and fair conduct and opinion – and contemporaries considered that he might be the only person truly respected by Ivan the Terrible. He was buried in the site of future St. Basil’s Cathedral. Saint Basil is not the only "sacred fool" buried here – also Ivan the Blessed was buried in church grounds in 1589. In 1555 Ivan the Terrible ordered to rebuild the churches. There were built new stone churches in the site of Trinity Church and surrounding eight wooden churches – Church of Trinity was consecrated on 12 July 1561. According to the popular tradition, architects of this amazing structure were Barma and Postnik Yakovlev. Now many researchers consider that this was one person, an artisan from Pskov. Legend tells that Ivan the Terrible ordered to pierce the eyes of the architect so that nothing similar is built elsewhere. Such conduct might be in the style of Ivan the Terrible, but it seems that legend was not correct this time. Name of Postnik appears in connection with some more beautiful Russian churches elsewhere (also Kazan Kremlin), built in later times. 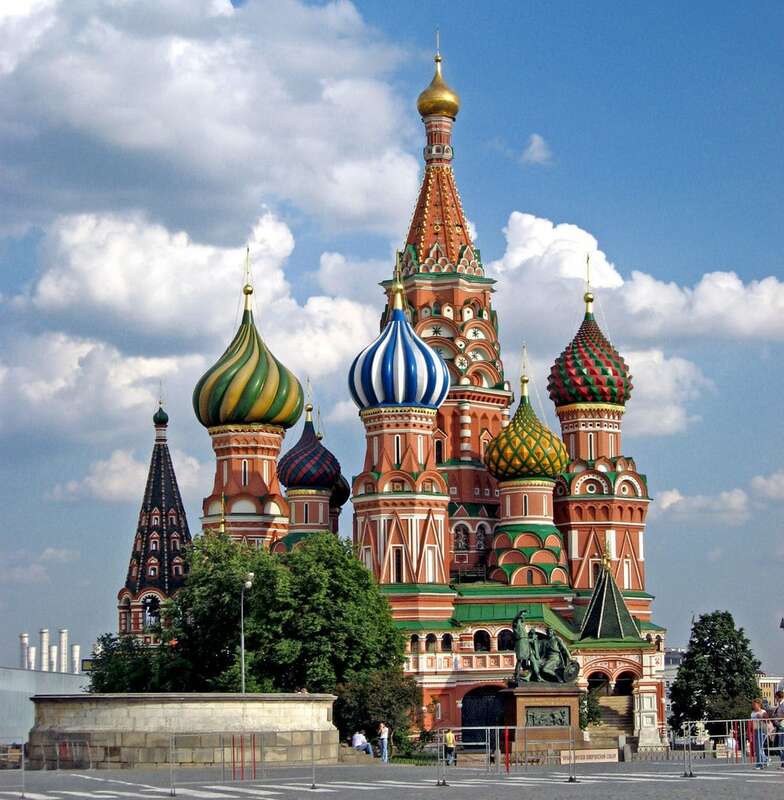 1561 – 1683: "Jerusalem Temple"
Saint Basil’s Cathedral was by all accounts very impressive and very well known building. The central church – Trinity Church, for example, was the tallest structure in Moscow until 1600 when Ivan the Great Bell Tower inside the Kremlin was raised up to its present height – 81 m.
The church gained high importance in the life of the city. The dense group of nine churches resembled a mythical citadel and was called "Jerusalem". 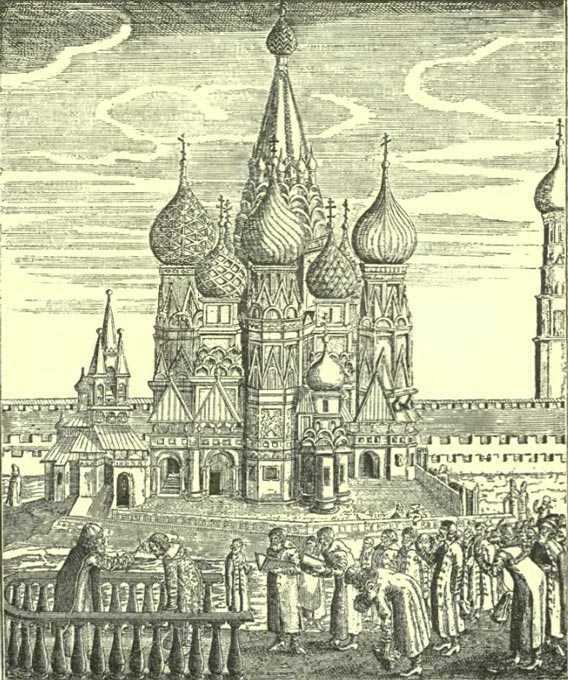 The structure served indeed as an allegory of the Jerusalem Temple in the annual parade, which was attended by the Patriarch of Moscow and the tsar. As the years passed, the church experienced numerous rebuildings. In 1588 there was added one more church to the complex – the tenth one. In 1583 there burned down the Trinity church – it was rebuilt in 1593. In 1680 – 1683 the former complex of ten churches was united by a ground floor. The newly built galleries were adorned with frescoes – rich floral ornamentation. In 1737 the church suffered from a fire. There were done extensive repairs in 1761 – 1784, when the walls of the first two floors were adorned with frescoes. Church was looted in 1812 by the French troops. Napoleon wanted to destroy it but happily it did not happen. The cathedral was restored back to its former glory in 1816. More restoration works were carried out in 1896 – 1909. Outstanding personality was the last keeper of the cathedral from the Orthodox church – Ivan Vostorgov. This socially active, tireless clergyman was executed by Bolsheviks in 1918. Bolsheviks initially were obsessed with an idea to demolish Saint Basil’s Cathedral. In 1933 it was even removed from the heritage register in order to start the demolition, but happily, the mood of Soviet leaders soon changed and the value of the church was recognized. Since then here several times were performed repair works. During the Soviet times the cathedral was seized from the Russian Orthodox community and was used as a branch of the State Historical Museum since 1928. It remains property of Russian Federation up to this day. Since 1991 here was renewed church service. In 1957 – 1961 there took place a meticulous work to remove the oil layers, painted in the 18th century over the old frescoes. The multiple layers of frescoes pose a challenge to restorers – it is not always clear which one of these is the one to be exposed. 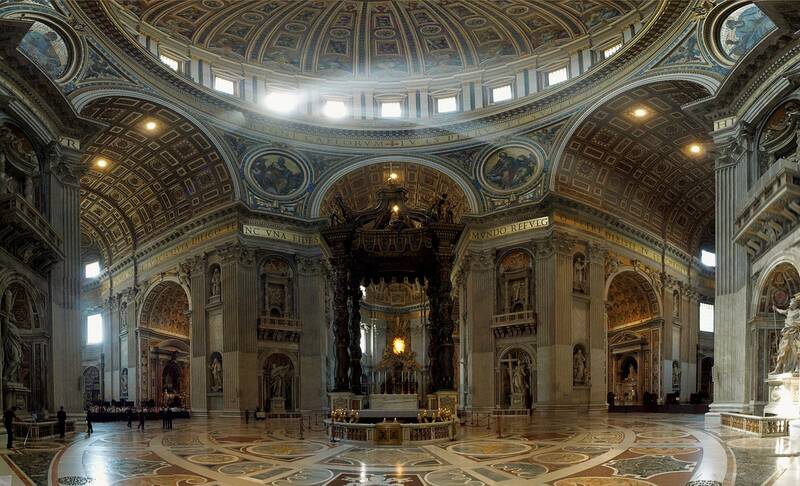 Nowadays the cathedral is one of the symbols of world architecture, a very popular landmark. It has been noted though that the building has an adverse impact from another important Russian tradition – the military parades on Red Square. The heavy tanks and jet fighters create cracks in the walls of cathedral. There has been no similar building built before or after. The complexity and amazing mix of details have no analogs in Russian architecture. It has left a huge impact on the development of Russian national architecture. Some researchers speculate that this design has its roots in Byzantine and Muslim architecture, some – that it has been influenced by the wooden vernacular architecture. It is also seen as an expression of a specific, indigenous Russian Renaissance style. There might be much truth in this, especially if we note that there were working Italian and Greek artisans in this time in Russia, bringing new thinking with them. Some art historians consider, that the planning of such complex of closely located churches was inspired by the Quolsharif Mosque in Kazan. This once beautiful structure was destroyed, when Russian troops invaded Kazan. It is also known that the same builders, who built Saint Basil’s Cathedral, worked also in Kazan and could bring new influence from there. The cathedral was built in the geographical center of Moscow City – the city developed around this location since the 14th century. Cathedral is located close to the Kremlin, but outside it. Originally here was located a busy marketplace. Saint Basil’s Cathedral is shaped like flames in a bonfire. The building consists of a central church with eight side churches. Central church and four surrounding churches are octagonal in plan. The four diagonally placed churches are cuboid. The eight smaller churches are placed in a symmetrical circle, while the central church is offset to the west to accommodate its apse. Eight side churches have onion domes, while the central one has a low spire with smaller onion dome over it. In total here are 10 cupolas. Onion domes were added in the end of the 16th century. Tenth cupola is rising over the bell tower – another beautiful structure built in the 1680s. Fundament of the buildings is made of white stone – here were found also some secret chambers. Churches themselves are built of red brick, which was laid around an intricate wooden structure – a spatial pattern of the future church. Exterior of the church is very ornate – but at the same time it is devoid of any sculptures and ornamentation taken from the living nature. All the amazing ornamentation is achieved by purely architectural techniques accomplished with brick. Currently the church is very colourful – the original one was less garish. Current color scheme gradually developed in the 1680s – 1848 – basically in the times of Catherine the Great. The design of the church in some ways is mirroring the nearby Kremlin. 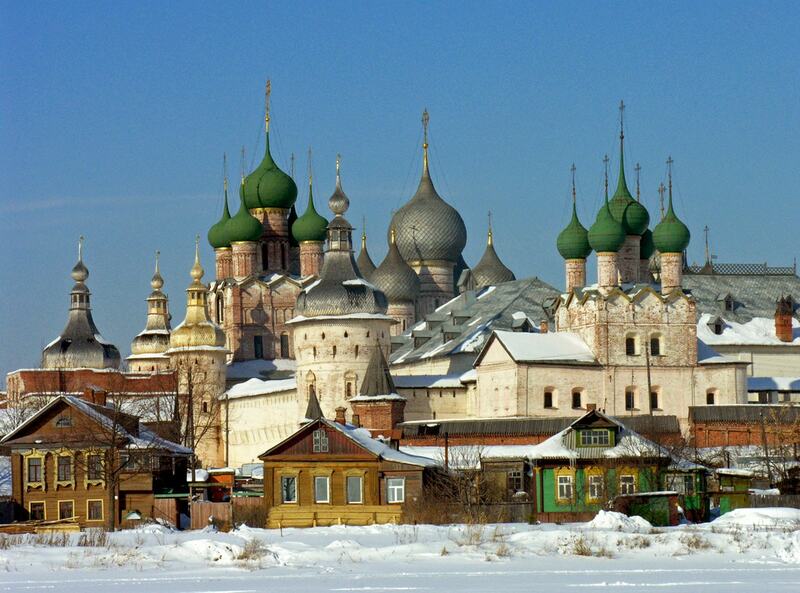 Very interesting is the covering of onion domes – each of them has distinctive design. The central church is 65 m high, with very small floor area – 64 m². Interior of the cathedral represents a maze of labyrinths. 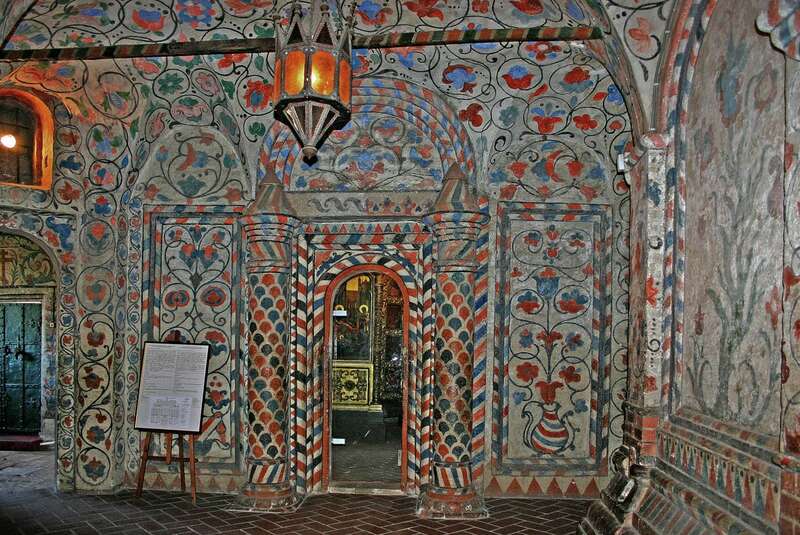 The chapels are surprisingly small, with opulent decoration. Especially interesting is the western corridor with unique caissoned ceiling. Notable achievement of engineering is the vaults represent – a brilliant example of the skills of stonemasonry. Unfortunately this skill was lost in the later Times of Troubles. Renowned are the frescoes covering the walls of chapels and other premises. There are numerous valuable icons and other art values in the chapels. Rostov city / Kononova E., Wikimedia Commons. This book surveys two centuries of Russian history through a succession of ambitious architectural projects designed for a single construction site in central Moscow. Czars, Bolshevik rulers, and contemporary Russian leaders alike have dreamed of glorious monuments to themselves and their ideologies on this site. The history of their efforts reflects the story of the nation itself and its repeated attempts to construct or reconstruct its identity and to repudiate or resuscitate emblems of the past. St. Basil’s Cathedral, also called “The Cathedral of the Protection of the Most Holy Theotokos on the Moat,” or the “Temple of Saint Basil the Blessed,” is an Eastern Orthodox Church in Moscow, Russia. The cathedral is a popular search on Wikipedia not only because it is a marvel of architecture, but because it serves as an important edifice for Orthodox Christians around the world.